A Dutch company aims to land humans on Mars by 2023 as the first step toward establishing a permanent colony on the Red Planet. The project, called Mars One, plans to drop four astronauts on Mars in April 2023. 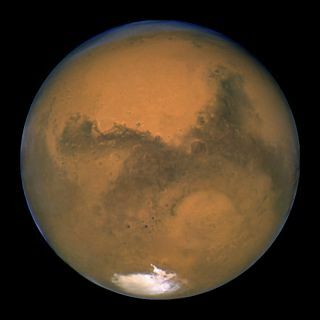 New members of the nascent colony will arive every two years after that, and none of the Red Planet pioneers will ever return to Earth. To pay for all of this, Mars One says it will stage a media spectacle the likes of which the world has never seen — a sort of interplanetary reality show a la "Big Brother." Mars One hopes to launch a communications satellite and a supply mission to Mars in 2016, then send a large rover to the Red Planet in 2018, according to the video. This rover will scout out suitable sites for the new Mars colony. The company will then launch settlement components — such as habitat units, life-support equipment and another rover — in 2020. The two rovers will prepare the settlement for the arrival of the first humans in 2023. Mars One officials say they've talked to a variety of private spaceflight companies around the world and have secured at least one potential supplier for each colony component. They plan to launch many components on SpaceX's Falcon Heavy rocket, for example, which is expected to be the world's most powerful launch vehicle when it starts flying. The Falcon Heavy is still in development, and SpaceX officials have said the rocket's first test flight could come as early as next year. Mars One estimates that it will cost about $6 billion to put the first four astronauts on Mars. While this may seem like a daunting sum for a non-governmental entity, the company is confident it can raise the needed funds by selling corporate sponsorships. "We will finance this mission by creating the biggest media event ever around it," Mars One co-founder Bas Landorp said in the video. "Everybody in the world can see everything that will happen in the preparations and on Mars." If all goes according to Mars One's plans, companies looking to advertise will pay big bucks for that exposure. "This is going to be a media spectacle; 'Big Brother' will pale in comparison," 't Hooft said. "The whole world will be watching and experience this journey." Mars One will begin selecting its first group of astronauts in 2013, according to its website. Though the company just made its plans public in the last few weeks, it's been developing them in secret since January 2011, officials said. Mars One isn't the only organization with its eyes on putting boots on Mars. President Barack Obama directed NASA to work on getting astronauts to the vicinity of the Red Planet by the mid-2030s, and SpaceX founder and CEO Elon Musk has said his company hopes to fly people to Mars within the next 10 or 20 years.